'Captain Morten And The Spider Queen' a film animated in stop motion and co-produced by Telegael in Ireland, Nukufilm in Estonia, Grid in Belgium and Calon in Wales is being launched this week at a market screening at the Cannes Film Festival. The film will also be screened at the Annecy International Animated Film Festival and the Zagreb World Festival of Animated Film in June. With a budget of €10 million the film has been six years in the making. It is the first film to be animated in stop-motion in Ireland and the most expensive film to be made by an Estonian film producer. 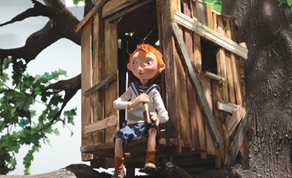 It tells the story of a boy who builds a toy boat only to find himself sailing in it together with a crew of insects. The all Irish cast includes, Brendan Gleeson, Pauline McLynn, Ciaran Hinds and Michael McElhatton as well as stand up comedians Jason Byrne, Tommy Tiernan and Neil Delamere. The film is the brainchild of Kaspar Jancis, winner of the Cartoon D’Or for his short film “Krokodil”. Jancis is a writer, musician and animator and this is his first feature film. To put himself in the right frame of mind he roughed out the storyboard on a boat from Rotterdam to the Antarctic. He disembarked at Tristan da Cunha by which time he had finished the storyboard. ‘Captain Morten And The Spider Queen’ is being sold worldwide by Sola Media. It will be released in French cinemas in the Autumn by Septième Factory.